The population of bees throughout the world is declining and some are even going to extinct due to some disastrous phenomenon. 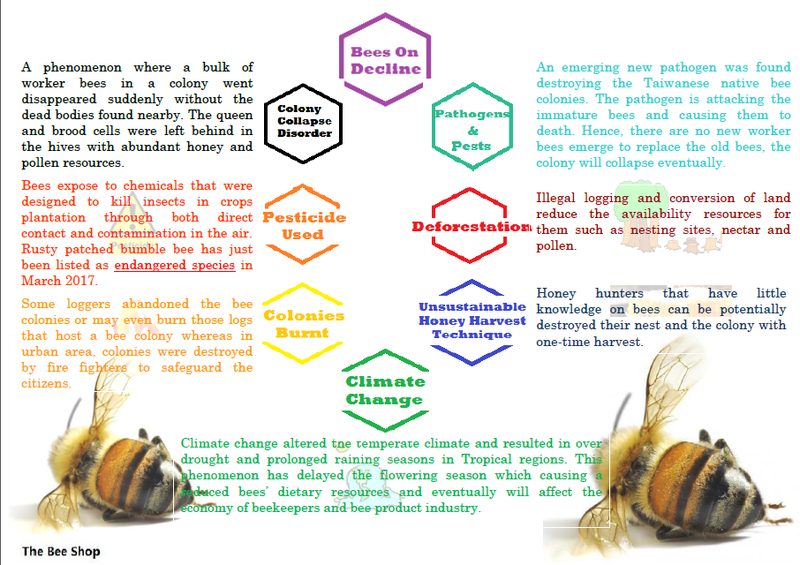 Colony Collapse Disorder (CCD) has been recorded as the biggest apiculture issue throughout the decades. This is a phenomenon where majority of the bee population went missing with very few dead bodies found near the hives. The queen bee was leave behind in the hive, plenty of food resources and a few nursing bees to take care of the queen and the remaining brood cells. Although there was plenty of food leaves behind, without the worker bees, they could not defend and sustain themselves for long, they would die eventually. Many research have been done to find out the cause of CCD, yet it is still uncertain, it is often associated with other factors like mites, virus, parasites, poor nutrition, human disturbance and most of all, the climate change. Studies show that human disturbance resulted to the changed of bees densities in natural ecosystems which causing a dramatic decline in their populations. Those human disturbances include destruction of natural habitat and over usage of pesticide. Deforestation and the use of pesticide are putting bees into risk. They are suffering from the loss or changes of their natural habitat with an increased agricultural land or oil palm plantation. In Malaysia, loggers chopping down the forest trees which reducing the availability resources for them such as nesting sites, nectar and pollen. Some loggers may even burn those logs that host a bee colony. The bees are losing their home and expose to chemicals that were designed to kill insects in crops plantation. Bees can be killed when they are intact with the pesticides directly. Although without direct exposure, the pesticide exposed in the air will eventually weakens the health of pollinators which making them more susceptible to disease and infection. Therefore, health issues like allergic, infertility, cancer, kidney failure etc are arising among people who exposed to the environment and those who consumed the agriculture products. So, just imagine that, if this could harm us, what’s more to our pollinators? Bees are essential pollinator for flowering plants to make them more fruitful and improve the genetic quality. Yet, can bees survive in a poisonous environment like this? Their surviving environment is even worse than us! Natural habitat keeps reducing drastically and the non-eco-friendly managed landscape is not favorable for them. Without bees, human wellbeing will surely be affected, lack choices of fruits and vegetables, we will also lose the sweet golden treasure from the bees hive. Therefore, something needs to be done to rescue the bees and restore our food security.